We are a 501(c)(3) charitable organization located at the Tracy Public Library in Tracy Minnesota. We are designed to serve all low budget public libraries in the United States. 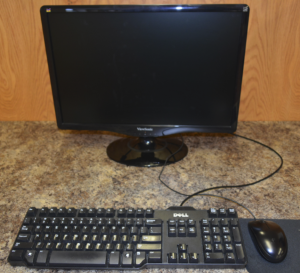 We provide computers and related equipment for FREE to any public library in the US. Currently libraries must have an annual operating budget under $250,000. We operate with a part-time staff of 1 person. We accept additional volunteer help and provide free computer training. We have an over-site board of 5 volunteer people (and are accepting 2 more members) to insure that your donated funds are used properly. We have NO overhead costs. We don’t pay rent or have any utility bills. Nobody is getting paid for their efforts in this venture. Costs from website development and initial startup have been at the founder’s expense. Our application for 501(c)(3) tax except statue was filed with the IRS on 6/17/16 and was approved on 6/22/16. Our funding is 100% donation based. Currently we have no funding. Help Us Grow!! The purpose of this business plan is to explain the foundation of Woody’s Library Computers (“WLC”), as well as showcasing the possible financials and operations over the next three years, with the hope of raising limitless amounts of money to give free technology to public libraries. WLC is a Minnesota based 501(c)(3) non-profit corporation founded in 2016 by Robert Knipe. WLC provides low budget public libraries with FREE computers. No administrative fees, no shipping or handling charges, and no strings attached. WLC believes everyone should have free access to a current computer. WLC wants to help people become more marketable to prospective employers by encouraging more learning opportunities. Free access to current technology should be expected when visiting any public library. • Increase or eliminate our library annual budget limit policy and allow more libraries to get free computers. Currently libraries must have an annual budget of under $250,000. WLC was founded in 2016 by Robert Knipe. He has been working with WLC’c inspiration (Woody) as his mentor fixing and giving computers to libraries, as well as working in the library industry for over 2 years. WLC also has an oversite board that will insure WLC’s funds are spent appropriately. Woody has been giving computers to libraries in southwest and northwest Minnesota since 2010. WLC’s plan is to first expand nationwide, second expand to Canada and Mexico, third expand to Europe, fourth expand worldwide. The plan is to expand to nations with lower need and higher wealth first so as to spread our help far and generate more financial support from the areas that have the wealth. After sufficient funds are available we will expand to nations where the need is high and wealth is low. With every expansion proper steps will be taken to ensure the technology is going only to public libraries and not to any one individual(s) benefit. WLC will begin with 1 Part-time employee, Robert Knipe, who wishes at this time to receive no compensation for his efforts. When the time requirements of the position become a full time job, WLC has sufficient funds, and Mr. Knipe would like to seek compensation, the board will meet without Mr. Knipe and decide what compensation if any should be given. The board must approve compensation for Mr. Knipe before WLC can hire any new employees. If Mr. Knipe vacates his position at WLC, any person hired to replace him will NOT be hired at a higher pay scale then Mr. Knipe had. Any increases in compensation for Mr. Knipe or for any other position must be pre-approved by the board. New employee(s) compensation will be determined by the board before posting the position(s) as available. The board will set wages by position, not by the individual hired. Wages set by the board must be close to the average pay for positions with similar qualifications in the same area. WLC is prohibited from paying bonuses to any person(s). WLC is prohibited from entering into contract(s) with any person(s) or company(s) requiring bonuses be paid, or if said contract(s) states a bonus may apply. The board will not be paid; members can also be an employee as long as that member does not cast a vote on issues related to their employment or compensation for their position. The board must use related information from multiple sources before determining compensation levels or awarding contracts. The board will consist of up to seven members. The board will meet once every 3 months or as needed whichever comes first. Meeting will be scheduled at a time that works best for the majority of board members and may be canceled if there is nothing to discuss. When they vote, a majority decision will rule. The board does not need to follow any pre-defined rules of order unless required by law, but may choose to do so. Board members may attend meetings by phone. If the majority of the members are not available to meet at the same time and the meeting can’t be rescheduled, board members may vote on an issue within a week of the first vote but cannot re-open the issue to debate. The board must verify the WLC’s funds and expenditures at every meeting. The board will not be given direct access to spending WLC’s funds or account numbers, but will be granted access to online statements at the meetings. The board will also have access to receipts as well as any other information needed to verify that WLC’s funds are used appropriately. WLC is located at 189 3rd St Tracy, Minnesota, 56175. This location is owned by the City of Tracy Minnesota for use as the Tracy Public Library. WLC is being permitted to use this location at no cost; no rent & no utility bills. At such time as WLC out grows this location and a new location must be found the board will need to approve the new location and this document must be updated to reflect the additional expenses. Steps must be taken in the search for a new location to insure additional expenses are minimized and are comparable or below the area market rate. WLC will rely heavily on volunteers to perform as many tasks as possible. Volunteers outside of the board will not have access to client and donor information. No volunteer will have access to WLC’s fund, bank accounts, or be able to remove WLC’s property from any location. In the event of dissolution WLC will follow all Minnesota and Federal laws including but not limited to Minnesota Statute 317A.811. All assets and funds will be donated to other 501(c)(3) charities or to public libraries as is WLC purpose. Currently there are no other programs in the US offering free technology with no strings attached. There are a few programs offering “Discount” computers but these computers are below quality expectations and overly priced. Currently there are approximately 120,000 libraries in the US, most of which qualify for our service. When the demand for service exceeds funding, WLC will prioritize requests on a first come first serve basis. WLC will not engage in paid advertising. WLC will advertise only via free advertising sources. WLC will continue its website www.woodyslibrarycomputers.org. WLC will utilize a qualification process to insure our free technology is given only to verified public libraries and that no one individual can obtain our services for personal benefit. The process may be done internally or through a third party, whichever is more cost effective. The process must include at least verifying the legitimacy of the public library and verification of the library’s annual budget to insure the library has a budget of less then $250,000. WLC will offer free computers to public libraries. Other free technology and accessories will be made available as funding permits; computers will have priority. WLC will make its free technology available to public libraries only. Private libraries, school libraries, churches, and other non-profits may not receive free technology. WLC will accept donations in all forms. Cash donations will be used to buy technology and pay for shipping and business expenses. Donations of technology will be accepted as long as the donated equipment is in a suitable condition. WLC will not engage in activity that could create debt. WLC will engage in fundraising efforts. WLC is unlikely to receive ample funding from private parties, but will try. WLC will seek large donations and sponsorship from corporations. Fundraising events may be held when opportunities permit. Current actual budget is $0. Proposed budget below based on a $100,000.00 annual budget. Current expenditures not expected to change in the next 3 years. WLC will not tolerate any theft or fraud. Any person(s), group(s), entities, etc… attempting to steal from or defraud WLC will be prosecuted to the fullest extent of the law and will be sued for the maximum amount WLC can obtain. Copy of this document not valid unless pages are initialed and last page is signed by board. A signed copy of this form is available upon request.